I CONSIDER myself pretty smart. So when my iPhone suddenly dies along with all my secret assignations and embarrassing emoticons, I don’t holler and tear my hair as many others might. I pick up the device and observe the blank screen with scientific dispassion. Then I holler loudly, tear my hair, and hurl the phone on the bed. I did the same to my younger brother for years and he turned out okay, if a tad addled, to eventually run marathons in sweltering 40C India. South Korean kids, however, leave us all in the shade. They regularly post the highest scores in the world on math aptitude and IQ tests. Yet there is one thing even smarter than a South Korean five-year-old, and that is a Korean style ‘smart’ home. In ‘intelligent’ homes, fibre-optic networks, retina recognition, fingerprint scans, and WiFi, trigger your favourite TV channels and preferred room temperatures and lighting as you arrive home. No need to think. In Songdo International Business District (songdoibd.com/), the brighter half of Incheon (which also hosts Incheon International Airport that serves Seoul), an entire smart city has arisen driven by exceedingly clever computerised neural systems that manage everything from pneumatic waste disposal – through pipes that deliver organic and non-organic waste, separately, to incinerators – to education, via LCD screens and videoconferencing with top teachers around the world. Yet, at top Songdo business hotels and Incheon conference centres it may be hard to come by an adaptor for your iPhone in a hurry, or a perk-me-up cappuccino. At Cisco’s (newsroom.cisco.com) state-of-the-art office in the gleaming POSCO tower at one end of Central Park – yes, this is directly borrowed from New York – computers monitor the population’s movement, pulse, and needs. On a vast screen here you can theoretically spot where your children are located (through chip-implant bracelets) and where cars are parked. Not quite yet, but almost. Rude motorists begone. It’s a bit like a real-time The Sims virtual game with one difference. This is for real. Is this shades of Big Brother or just the next step in ramped up efficiency as smart-city advocates aver? After all, that’s where technology is leading us. Efficiency and healthy leisure pursuits are certainly abundant. Citizens of this custom-built town rarely need to walk more than 15-20 minutes to reach work, and this through the invigorating green lung of Central Park with its manicured gardens, scenic strolls, jogging trails, majestic foliage, and captive deer, all set around a two kilometre seawater canal and lake. Bridges arc over the water as paddleboats and kayaks glide across this inviting expanse. Of an evening or on weekends, day-trippers and local families careen around on twosome or foursome bicycles with the sound of children’s laughter mingling with birdsong amid the tall wild grass that covers much of the place. It’s an idyllic and fun setting peppered with innovation and irony. There are no discernible waste bins in the park, or on street corners – which will give visitors pause – as all waste is automatically recycled. Images of lost children may one day be flashed on video walls to alert passers-by. Cameras on street lamps will detect accidents or a fracas and alert first responders. And Nintendo Wii style video walls will read hand and body actions for you to activate maps, information, and ‘concierge’ chats for some face-to-face human advice. Cisco terms it the ‘internet of everything’. It almost is. Songdo IBD is the archetypical meticulously planned city of the future envisioned by The Jetsons or, more darkly, Blade Runner, a future that is now, but still strangely absent. Wondrously, there is no traffic to speak of (taxis are not easy to spot), pavements are broad, tree-lined, and unpeopled, and park-view homes retailed for US$400,000 to US$5m for 2,000sq ft even before they rose from the ground reclaimed from the sea flats. Home prices remain high as people move out of congested cities to the south, seeking more space and green environs for young families. The city’s pride and joy is its 18-hole (par 72; 7,413-yard) championship course run by the Jack Nicklaus Golf Club Korea (jacknicklausgolfclubkorea.com/). Designed by golfing legend Jack Nicklaus, in October 2015 this brand new course hosted the first ever Asian tee-off for The President’s Cup (USA vs the Rest of the World), a classic display of alpha male swagger, limber backs, strident national anthems, and beer, kicked off by former US President George W Bush and chaperoned by South Korea’s then hugely popular President Park Geun-hye. More green and walking trails are available at two smaller parks downtown, Michuhol Park and Haedoji Park. Bluff, blustering, always beaming, and larger-than-life Stan Gale, a one-time rising soccer star turned developer, heads New York-based Gale International (www.galeintl.com/), a prime Songdo IBD catalyst. To describe him as a typhoon of energy, bonhomie, and resolve, is an understatement. He was brought in to help fashion this US$35 billion planned city along with steel conglomerate POSCO (www.posco.co.kr), and Incheon Metropolitan City, with help from engineering behemoth ARUP (www.arup.com/). It was Stan who convinced sceptical city officials that 100 acres be set aside for a central leisure space with a further 200 acres for golf. “They literally fell off their stools,” he jokes. This was, of course, prime land downtown where flat and office sales could speedily recoup investments. Kohn Pederson Fox (www.kpf.com/ known for its iconic designs including the ‘bottle opener’ Shanghai World Financial Center (that houses the Park Hyatt), unsurprisingly wrought a similar towering marvel for NEATT (North East Asia Trade Tower), home to several Songdo biggies and with an unrivalled view that stretches for miles across the 1,500-acre development with a population of about 40,000 by 2018 that will house some 70,000 residents and three times as many commuters by 2020 or so when complete. Much of this is in LEED-certified buildings. Such is the focus on environment and sustainability here that the Green Climate Fund (news.gcfund.org/) brought its secretariat to Songdo. The World Bank has a presence here along with several multinationals and biotech and I.T firms. The main Incheon development, it's sibling across the bridge and the district to which Songdo is assigned, is home to three million people, making it the third largest city in South Korea. So is it actually possible to plan a city and get citizens to operate in the manner the computer models predict? And what happens when a city is smarter than its inhabitants? New York-based writer and critic, Lewis Mumford, a keen observer of the urban ethos, wrote presciently in 1946, “We must give as much weight to the arousal of the emotions and to the expression of… aesthetic values as we now give to science, to invention, to practical organization. 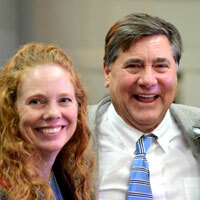 One without the other is impotent.” He could have been speaking about Masdar in UAE, or Songdo, South Korea. What he meant was, city planning defies the logic of growth that is often haphazard and accidental, a cross pollination of random circumstance, idea, and necessity. Human beings have a tendency to break laws and create unplanned spaces that by definition ensure diversity. How else could you pair the dense commercial labyrinth of Mongkok in Hong Kong with the privileged prattle of The Peak; the mayhem of Chandni Chowk in Old Delhi with the stately homes of Lutyens’ New Delhi; or the clamour of Chinatown and Little Italy with the orderly greens of Gramercy Park in New York City? Cities develop their own unique character because of people and their preferences and patrician or plebeian taste. As Jean Jacques Rousseau wrote in his seminal 1762 The Social Contract, “Houses make a town, but citizens make a city.” Still, intelligent pre-packaged cities are here, perhaps to stay. Songdo, a 30-minute drive from Incheon International Airport (www.cyberairport.kr), is an incredibly smart city that’s somewhat hard to find, even for smart people. With one bus linking it to Gangnam Station in Seoul (Bus M6405, W3,000), and one to the airport, this ‘aerotropolis’ has sprung up seemingly without neural connections to the rest of the country, including Seoul. This poses a risk to fast-track growth. A team-up with Seoul would make for a very healthy partnership. Seoul has convention space and conferencing variety, while Songdo is an Asian cruising springboard with weekend elbow room for city slickers. A train ride to the capital involves several changes and will flummox the most hardboiled travellers. Easier to hop into a taxi for a one-and-a-half-hour drive to City Hall in downtown Seoul for around W45,000 or more (exchange rate US$1=W1,062). While a limousine bus from Incheon Airport to most Songdo hotels (touching Grand Hyatt Incheon, which is right next to the airport, Sheraton, Oakwood, Orakai, Central Park, Ambassador, and Holiday Inn) costs about W7,000 for the 30-minute ride along a seven-mile highway and an impressive cable bridge, a taxi will set you back around W38,000 (including the bridge toll) for a 20-minute drive. With the Incheon Free Economic Zone (www.ifez.go.kr/eng) designed to attract well-heeled business traveller suits it is likely you might visit Songdo for a conference or a small corporate meeting in futuristic environs. You might come in with a biotech firm for a spot of research, you may be a geeky gawker in search of hi-tech insights, a blue-rinse cruise aficionado, or you might be in education. 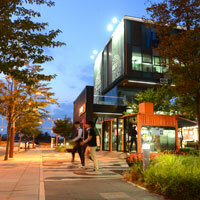 The city is sprouting quality schools and colleges like the highly regarded Chadwick International (www.chadwickinternational.org). 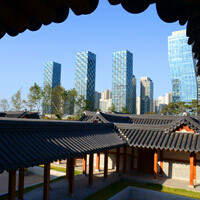 Yet, Songdo, for all its seemingly sparse development and wild look, is a big draw for families. The ‘city’ is still just sprawling acres of pleasant grassland from which sprout a few well-spaced modern reflective glass high-rises girdling Central Park and its waterways (before the skyline dips downwards and outwards with a series of bland apartments), and a few blocks of bio-tech industry, all scrupulously low-rise. The city literally melts away as you move away from Central Park. 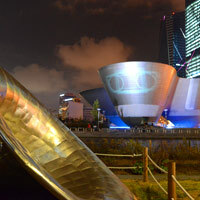 Here’s our Songdo fun guide. Of a weekend the city centre can be hopping with visitors in search of the great outdoors, exercise, kayaking, cycling, mini-cruises, playgrounds, and fresh air. There are occasional open-air music concerts. Quirky art abounds along the Central Park jogging trail, especially between the shingle-roof Gyeongwonjae Ambassador hotel and the distinctive inverted cones of the Tri-Bowl, which host art exhibitions. In the woods, look out for bronze horses, Grecian faces, playful whales and a naughty trio peeing merrily into the canal. 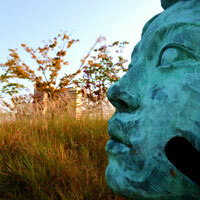 A little farther out on a promontory overlooking the airport bridge is the Incheon Art Center. Next to the Gyeongwonjae Ambassador hotel is an attractive and atmospheric made-to-purpose traditional all-wood Songdo Hanok Village with restaurants, ice-cream and gardens. Here you’ll come across Japanese fare and coffee shops as well as excellent local Korean food in the form of Kyung Bok Kung (tel: [82-32] 834-2345) where marinated beef short rib, or ‘kalbi’ for one will set you back just W31,000 with its assortment of side dishes and kimchi. If you haven’t died yet and gone to heaven, this one’s for you. Central Park is the focal point for the city, a meeting ground, and the heart of things that will make all the difference between master plans on a passive drawing board and interactive human drama. This is where the city is slowly finding its soul and most of the major hotels – and shops – are arrayed around it. 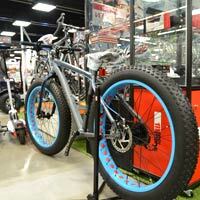 At one corner by NEATT is the Lotte Mart, with everything from outrageous mountain bikes and boots to baby wear. To cater for a growing population and visitors, an ambitious Lotte Shopping Town is coming up with a department store, hyper mart and movie theatres. 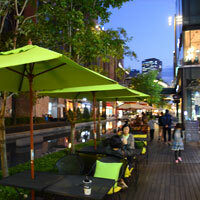 Much of the better shopping however is across the park at the Central Park Towers (with their food courts) and around the corner at the inspired NC Cube (facebook.com/nccube.kr), a set of four low-rise cubist blocks through which runs Canal Walk, a narrow lane of water dotted with frozen wading statues and surrounded by timber boardwalks, haute fashion, factory outlet offerings, coffee shops and restaurants. This is a fun place for a stroll or a serious Songdo shopping browse with occasional street-side music performances to enliven things. Ah the joys of planning – you get a dollop of Manhattan and a dash of Venice all in one but with a solid contemporary feel and fine Korean finish. The buildings are reminiscent of parts of Manhattan with brick and stone and large graffiti lettering and brand names from It’s Skin and Missha (http://www.misshaus.com/) for cosmetics, to Guess, Adidas and TaylorMade (for golf clubs and accessories). Pop by fun stores like Michaa, Thursday Island, and SPAO with their zany clothes and casual wear. If you’re done with shoes at ABC Mart, try the open air flea market in Block 1 with Reebok trainers going for W54,000 (60 percent off), Zara Man shirts at W10,000, and say a Monocle woven full sleeve cardigan for W60,000. Apres shopping park at one of the many coffee shops to people watch without being perpetually jostled as this is a fairly quiet corner, much like Songdo itself, even on a busy day. Pick Korean, Vietnamese, Japanese Udon noodle soup, premium coffee, Thai, or wander upstairs to the second floor for more varied restaurant choices. If Incheon Airport duty-free shopping is your thing, on the way out, browse Fendi, Celine, BVLGARI, Chanel, Calvin Klein, Burberry, Salvatore Ferragamo, Emporio Armani, Furla, COACH, and Gucci outlets. There are designer brands galore. Grab a duty-free Johnnie Walker Black Label one litre (US$41), a 12-year-old Chivas Regal one litre (US$41 as well), or a 50ml eau de parfum (EDP) of J'Adore from Dior (US$113). For more duty-free perfume, a 50ml EDT of Miss Dior is priced at US$92, and a 60ml skin repair ginseng cream from Sulwhasoo will set you back US$169. The popular Sulwhasoo Snowise skin whitening cream retails for about US$99 for a 50ml bottle. At the other side of town but again not more than a 15-minute walk on Convensia-daero (the main drag, ‘daero’ means ‘street’) is Dream City (and Millennium Tower) with its food court and pub-style bars for the younger set along with Korean and Asian fare. If you’re really bored you might gawp at the building facades that advertise hair clinics, dental clinics, cosmetic workups and massage. That about sums up a Songdo soirée. Any more would be a stretch for any fun guide. With three main roads inscribing a rough ‘A’ around Central Park, Convensia-daero is the cross on the letter A (this is where you’ll find NEATT and the Convensia hall for MICE and conferences) with Incheon Tower-daero and Central-ro forming the sloping sides. Art Center-daero is a horizontal tick across the top of the A and this is where NC Cube is located. The main subway line runs under Incheon Tower-daero and cross street Songdogukje-daero. Finding a hotel in Songdo is a doddle. You can count the best on the fingers of just one hand. Of course, if you stretch to Incheon Airport and the cluster of rooms there, including the Grand Hyatt, you might need two hands. The space-age 8,416sq m Songdo Convensia (www.songdoconvensia.com/) meeting hall next to the central NEATT handles Songdo conferences and events with aplomb. With most quality hotels within walking distance, almost all Songdo properties will lay claim to being conference hotels though not all are set up for the demands of international business. Take your pick of formal or informal, contemporary or quirky. 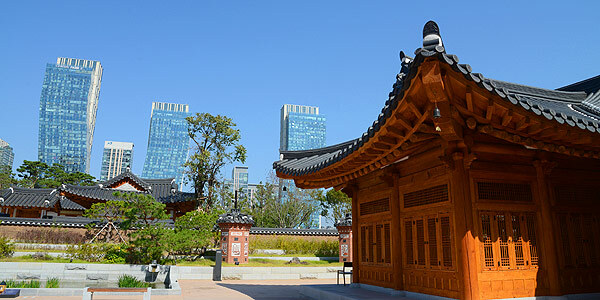 The star of the show, is the traditional Korean ‘hanok’ style Gyeongwonjae Ambassador Incheon (May 2015) that maintains a discrete presence adjoining the southwest side of Central Park with its handsome low wooden structure, sloping shingle roofs, and broad gravelled courtyards with flowering trees. This is a period construct paying homage to Goryo (also spelled Goryeo or Koryo) dynasty architecture using rustic rough-hewn wooden beams in a Buddhist-inspired pagoda design. Not surprising then the ambience is one of quiet zen contemplation, enhanced by simple but rich wood tones, and a supreme lack of clutter. This is the charm of this unique Songdo heritage hotel. From the intimate lobby with its intricate peacock shell inlay, beaming bellboys will guide you to your room, set on the ground floor and opening directly onto the courtyard, in a villa, or one floor up set along an open-sided corridor that is a tad brisk in winter but with refreshing hotel and park views especially at dawn and dusk. In a first-floor 43sq m Deluxe Numaru, you leave your shoes in the narrow foyer and slide the rice screen partition to enter the simple bedroom with its high wooden beam, plain cream walls, small screened windows, and a plump white king bed or a combination of a double and a single (for families) adorned with electric blue and crimson silk runners. 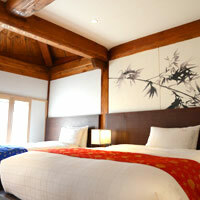 Charcoal brushstroke bamboo fronds on the bed’s head wall are the sole concession to adornment. A small alcove closet and slim desk are set to one side with two international three-pin electric sockets and internet cables. All other sockets in the room are deep round hole with two pins. WiFi is free. Expect an iron and ironing board, a flat laptop-friendly safe, flat-screen TV (mainly Korean channels, no CNN or BBC), electric kettle, Nespresso coffee shots, soft and firm pillows (both boldly marked so you make no mistake) and small windows that can actually open. There’s no double glazing but street sounds are minimal and there is a blackout blind should you require it. It all requires a bit of fiddling about and finger work, but is fun. The toilet features a Japanese potty that does everything except automatically rear up when you enter and I think I prefer this. It will minister to your derriere in fine fashion. A small but feisty hairdryer is mounted to the wall and there is a weighing scale for the intrepid. A small glassed-off area is where you’ll find a rain shower and hand shower and a square step down granite bathtub by a window. As at most Korean hotels, air-conditioning in winter is devilishly hot and dry, and this should be your first item of attention. On the electronic console tap the temperature arrow down to about 18C till you see the background change to blue. This means the aircon has switched from heating (red) to cooling (blue). Then arrow up to your desired temperature. Cooling will not happen unless the background is blue. Remember the floors are heated too, so adjust this if you wish. Or cook to well done perfection overnight. I am grateful therefore for the nimble intervention of Joe Dahl the dapper, energetic and affable young general manager who explained this arcane secret to me. You will constantly spot him on his vigorous rounds, always with a big smile, calibrating his whimsical relic to match the needs of the international set that is slowly finding its way here. The Gyeongwonjae Ambassador also has ‘Ondol’ floor sleeping Korean-style rooms and two two-bedroom Villas, or Royal Suites set apart in their own private enclosure with alfresco courtyards. Pick these if you are planning a longer stay here or want space for private meetings. For larger meetings, banquets and events, there’s an impressive Goryo-style hall, GyeongWonRu, set to one side of the hotel. It certainly beats run-of-the-mill hotel ballrooms. This function space can accommodate up to 400 people theatre-style or 250 for banquets. There's an outdoor space too that seats 1,000 theatre-style or 500 for a stylish wedding banquet. Breakfast is served leisurely from 7am to 10am. Staff are a delight – bright, attentive and quick to smile and go the extra mile to resolve issues even if not immediately understood. Bring along plug adaptors to Songdo. These are life savers. The Nespresso machine does a great job once mastered, and for a cappuccino you may have to wander next door to the Korean Hanok Village. At the Ambassador, find resort-style, slow-stepping, period lodgings without undue fuss or luxury stress. Mark this one down in your diary for a weekend jaunt or a longer stay. 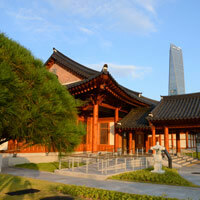 Should you be visiting Seoul, this is still an excellent weekend retreat for a honeymoon stroll or a trip out with the kids. Fresh air and flushed cheeks are de rigueur. Right across the road are the curved gold reflective glass blocks of The Central Park Hotel (opened late 2014), which at first glance resemble the Wynn Macau. This is a large hotel set up for weddings, banquets and meetings that even offers indoor golf and a water park. It has three convention halls, the largest for up to 730 persons. These are not really ballrooms but long rectangular spaces with scenic windows running along one side. Rooms are lavish, designed to impress with faux-European touches, lots of gilt panelling and a rather unrestrained Baroque flair. Think pink marble floors, see-through glass partition bathtubs, large mirrors with ornate gold frames, and a work desk also in golden hues. Find a flat-screen TV, one solitary three-pin plug socket at the desk and marbled bathrooms with rain showers (cubicles in gold trim) and copper window drapes. All the business traveller trimmings are on offer though you may need to pop your eyes back in the sockets from time to time. The space is a touch gaudy and flash but will appeal to many with its high-roller casino feel. The cream marble lobby has high ceilings and space to move large numbers in and out and is a plainer construct compared to the corridors and rooms where the flash really starts to present itself. Most of the top Songdo hotels are situated around Central Park with almost identical views – depending on the height of your room – with perhaps the best vantage spots at the serviced apartment Oakwood Premier Incheon (opened July 2014). This is sited in the signature NEATT with a light-filled lobby up on the 36th floor. Panoramas stretch in most directions as you walk around this level to the restaurant to get a fix on the Songdo layout. The bar overlooks Central Park. From here it is possible to see exactly what the architects dreamed up and what the urban planners hope to create. The lobby is all neat square-lines in cream marble with brown tones and dark woody accents. The high ceiling creates visual space with the comfy leather sofas in the middle offset by smart carmine lampshades. The place is neat, functional and stylish in a corporate manner. This is a dependable Songdo business hotels pick despite its main focus as a long-stay residence. WiFi is charged alas but for many long-term guests it is included free in the package. A Studio starting at 41sq m serves up cool marble floors with pastel tones, a long work desk and the de rigueur chocolate accents. One Bedroom apartments brighten up with purple runners and speckled carpets over 84sq m of rumpus space while 234sq m Four Bedroom residences offer smart dark timber floors, four-poster beds, sparse decorative green foliage, leather easy chairs, and panoramic views right from the bed. All rooms have large flat-screen televisions, functional kitchens with stove, microwave, fridge, and a washer/dryer. Expect rain showers, soaking tubs in larger units, steam saunas (one bedroom units and above), and home theatres (in three-bedroom units and above). 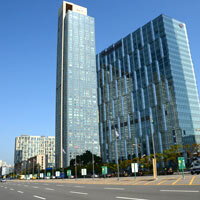 In Songdo, Oakwood is the pretty much the sole long-stay Incheon hotels choice for corporate travellers and people relocating to the city. It has the kit and the location. Right next door after the Songdo Convensia, is the Sheraton Incheon (opened 2009). This is a rectangular reflective glass building of modest height on Convensia Road. There’s an element of bling (but not too much) in the bright lobby with its tan sofas and Link@Sheraton for those who need to stay plugged into the internet. Staff is brisk and accommodating. The 321 rooms are smart and uncluttered, with modern furnishings, large windows and that signature hypoallergenic Sheraton Sweet Sleeper bed. A Deluxe King offers cream stone floors with a dark chocolate-purple carpet, brown leather easy chair, a work desk with two three-pin multi-plug sockets, data-port, and a smallish LCD television on a stand. Pipe reading lights are set either side of the bed. Beige bathrooms offer a rain shower and separate tub. WiFi is charged. Of course, Link@Sheraton is complimentary. Suites serve up huge TVs, one in the living room and one in the bedroom, with eight-seater dining tables, a small bar with high chairs, and a faucet for post-party clean-ups. Iron and ironing board and coffee making facilities are included in most rooms. WiFi is free on Club floors and the 22nd floor Club Lounge (with card access) has grand views and laptop stations with a one-hour free use of a meeting room (that seats up to 10). South Korea’s first fully non-smoking hotel was also built entirely with eco-friendly materials – so keep up the good work and stay healthy at The Spa Hasta. The well-equipped 24-hour gym on the sixth floor is a big draw and the indoor pool, open from 6am to 10pm, is set to a welcoming 30C. The Sheraton has a grand ballroom for Songdo conferences and meetings and can handle 300 people banquet style. There are eight function rooms as well for small corporate meetings in Incheon should your company require this facility. Rounding up our brief Incheon business hotels guide are the Orakai Songdo Park Hotel, and the Holiday Inn Incheon Songdo. Both are comfortable choices, the Orakai across the road from one corner of Central Park near the Lotte Mart and closer to Convensia for meetings; the Holiday Inn a bit farther away from both the park and Convensia but within jogging distance. Orakai rooms are unfussy with wood accents and pastels almost reminiscent of the old Hyatt look for road warriors in search of similarity rather than divergence. Expect tall windows welcoming of light, a 32-inch television, and free WiFi. Also look forward to usefully functional work tables, comfy chairs and heated toilet seats. Suites toss in leather armchairs and brighter wall paintings. Thirsty Monk is an informal beer bar for evening tipples and this is supplemented by two restaurants, one with Korean and international buffets. The hotel strives to be child-friendly and even has on hand a ‘first birthday’ team for your child’s very first annual celebration. Orakai is a convenient and well run business hotel for conference delegates. Try to get a room with a Central Park view. It makes a big difference. Set in a reflective glass high-rise, Holiday Inn Incheon Songdo is similarly kitted out in pastels, this time with rooms in beige and lavender with speckled carpets. WiFi is free and the lobby is on the 19th floor. A small ballroom caters for up to 255 people theatre-style. As with the other hotels mentioned here, Holiday Inn is served by the airport bus, which makes it a convenient choice though there’s more walking involved for restaurant and meetings access. And about two kilometres from Convensia, better room deals with less trimmings are available at the Ramada Songdo Hotel, and the futuristic virginal white minimalist bling Hotel Cube Songdo where about W70,000 (US$60) could do the trick. Incheon business hotels take their lead from the modern and briskly run 524-room Grand Hyatt Incheon right next to the airport, a short distance from Songdo. It started out as a Hyatt Regency and morphed into its current Muscle MICE incarnation on 1 September, 2014 with a total of 1,022 rooms and suites and residences. The hotel’s West Tower has been given LEED certification and the modern lobby with glass frontage has a cream curved space design that lends a futuristic tone to the place. 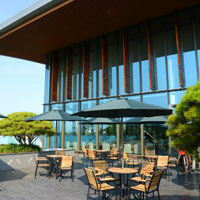 This is a fine spot for Incheon conferences or corporate meetings with 30 function areas including an outdoor event venue. The largest space, in the new wing (the hotel has two blocks) is the Grand Ballroom with room for 800 banquet style or 1,200 cocktail style. WiFi is free and there are three swimming pools to unwind in including a pool for kids. The hotel is a child-friendly option too with a kids' playground to entertain minors. Rooms in the new tower are clean and uncluttered with back-lighting on crisp white walls, grey carpets and woody accents. Look out through sloping windows, and walk on cool pale wood flooring. Expect fluffy duck down duvets, iPod docks, coffee-making facilities, multi-plug power sockets, virginal white bedside cabinets and mod work desks, and flat-screen TVs. The stark whites married with wood and grey will appeal to business travellers. Later try out the fitness centre for a post-prandial workout. The hotel is a three-minute drive from the airport and the vicinity offers a few shops and restaurants but not much else. Within walking distance of the terminal is the Best Western Premier Incheon Airport Hotel. The hotel has a shuttle bus to the airport as well. Rooms offer flat-screen televisions with movie channels and come in various configurations including deluxe, twin and ‘Ondol’. A pricey Premier Suite retails for just under W400,000 with a lavish interior featuring a creamy white press-button headrest for the bed and grey-stripe sofas. Deluxe Twin rooms are plain but functional with flashes of blue in the form of floral paintings with cream carpets. Also find a fitness centre, indoor golf and a ballroom seating up to 400. Also look at the neighbouring largish Paradise City hotel-gaming-and-entertainment complex. That about sums up our Songdo fun guide with its smattering of business hotels, shopping, and incredible smarts. 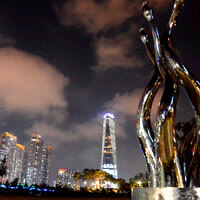 While Songdo and Incheon lead South Korea into the future, I am back in Hong Kong, somehow smarter and more aware. The toaster’s not working now. Time to smartly smack it about or throw it on the bed. That’s how we old timers deal with technology. Exchange rate roughly US$1 = W1,122. Songdo hotels may additionally levy a 10 percent VAT (hotel tax) and 10 percent service charge. Ask for promotional discounts especially during low season and check with your travel agent for the best prices. Also look at best available rates (BAR) that hotels post online from time to time. Most hotels will permit check-ins after 2pm with some holding out till 3pm. Room rates are roughly from W170,000-W200,000 depending on hotel category and season. Higher room categories will range from W300,000-W500,000. Airlines. The national airline Korean Air is at www.koreanair.com and Asiana Airlines at www.flyasiana.com. Fun and feisty low cost carrier Jin Air is at www.jinair.com. Gyeongwonjae Ambassador Incheon. Tel: [82-32] 729-1101, fax: 729-1102, (e-mail: gwj@ambatel.com or gyeongwonjae.ambatelen.com). Holiday Inn Incheon Songdo. Tel: [82-32] 250-000, fax: 250-0001, (e-mail: reservation.songdo@ihg.com or www.holidayinnsongdo.com/ or www.ihg.com). Hotel Cube Songdo. 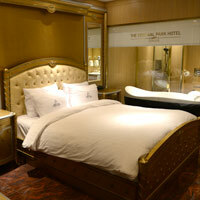 Tel: [82-31] 834-1771, (www.hotelcube.co.kr/ or www.facebook.com). Oakwood Premier Incheon. Tel: [82-32] 726-2000, fax: 726-2020, (e-mail: sales.oap@oakwoodasia.com or www.oakwoodasia.com/korea). Orakai Songdo Park Hotel. Tel: [82-32] 210-7000, (e-mail: rsvn@orakaihotels.com or www.orakaihotels.com/songdo). Sheraton Incheon Hotel. 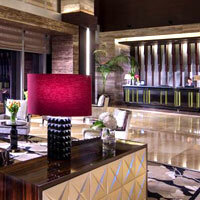 Tel: [82-32] 835-1000, fax: 835-1001, (e-mail: Sheraton.incheon@sheraton.com or www.starwoodhotels.com/sheraton/). Ramada Songdo Hotel. Tel: [82-32] 832-2000, fax: 830-2349, (e-mail: rs@ramada-songdo.co.kr or www.ramada.com/hotels/south-korea/incheon). The Central Park Hotel Songdo. Tel: [82-32] 310-5000, fax: 310-5100, (www.centralparkhotel.co.kr/). Best Western Premier Incheon Airport Hotel. Tel: [82-32] 743-1000, fax: 743-1004, (e-mail: bw@airporthotel.co.kr or www.airporthotel.co.kr/en/). Grand Hyatt Incheon. 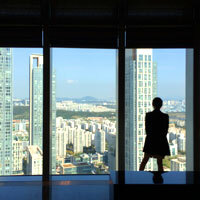 Tel: [82-32] 745-1234, fax: 745-2500, (e-mail: incheon.grand@hyatt.com or incheon.grand.hyatt.com). How to pick a hotel, or even a bed in a library bookshelf!